The facilities are exactly what I would like, the staff was very helpful, and the cost was reasonable, the available travel ability was super! We are very happy with Rosewood Estates. The apartment is very comfortable; we don't have complaints. We haven't been here that long, but they have a lot of activities going on. The food is very good. We are very happy overall with our decision to move here. Rosewood Estates was absolutely wonderful. They had everything we wanted. It's all-inclusive. We saw one-bedroom apartments that were all good-sized. They had a movie theater, card games, and bingo, and a whole schedule of activities for the month. They served three meals per day, you can have your laundry done, and they would take you to where you want to go. We had a wonderful lunch. The food is only average and sometimes poor. The cleaning staff is terrible! The activities are fun and get changed up which is nice. The management is sometimes friendly. I stayed at Rosewood Estates for a year and a half. The place was OK. The food was good, but the management was so-so. It was a good place to live in, and I liked it there. The staff was good. The activities were good, and they took us to the mall once a week or wherever we want to go. My studio room had a good size. Rosewood Estates left a positive impression on me. I liked their activities and the energy level. The staff was super friendly. They followed up with me and were very professional. Their rooms were pleasant. We did not choose this place because of the location. My mother wants to go outside and walk, but the location was in a business area. They did not have a lot of outdoor space. Rosewood Estates seemed to be nice. There were residents involved in the activities when I was there on a weekend. They had a nice floor plan. The person that gave us the tour and the receptionist were courteous. I looked at a two-bedroom apartment that seemed quite spacious. It was conveniently located to shopping. If you still drive, it would not be a problem at all because it was convenient. If you had to walk, it would be possible. It was close to a grocery store, deli, and retail shops. They had kitchen facilities and a dining room. I really liked Rosewood Estates' high ceilings, lots of lights, and lots of windows. Everything was beautifully appointed and decorated. I've eaten there twice, and the food was very good. I liked the rooms. Each one had a little outside patio area, even on the second floor. They encouraged pets and provided a little fenced-in patio area on the ground floor where you could let your pets out. Rosewood Estates was nice, and they had pretty good meals. If you wanted to hire a caregiver and sat with the person there; it was OK, but you had to do it on your own. It was an independent living only, but they had amenities and activities. I have an aunt that lives at Rosewood Estates. Food is good. My aunt is very satisfied with it. They’re home-cooked meals. Rosewood Estates is beautiful. Everything about it is beautiful. I could not imagine anybody wanting to live anywhere else. It’s a perfect place for someone to start their new home. I liked Rosewood Estates very well, and it was excellent. I found no complaints about it. The food was good, people were friendly, staff was nice, and everything was top-notch. The facility is very good. They had a very nice beauty shop within the facility. Rosewood Estates has been designed to be pleasant looking. I'm not sure that the comfort level that they depict is what I feel. From what I've seen so far, the aides are kind of ignorant in terms of the way they handle the residents. The food has been tasty, but the quantity of serving differs every time. A lot of people here are handicapped. They don't have emergency aides inside; they would have to call the ambulance or the EMT people. Rosewood Estates is nice. It isn't the least expensive place, but it has everything that we want. My mother has been there almost two weeks, and she has just been really happy. So far, we've been very pleased. The residents are very active; they have lots of activities and things to do. The staff is very caring, and it's been extremely nice. The food is very healthy. They are looking out for their residents' health. The food is delicious, good, well-prepared, and hot. I just moved into Rosewood Estates, and it's very clean and nice. The apartments are really nice. I like it here. I think it's just right for me becuase I didn't want anything big. It has a little kitchenette, a lot of closet space, a bedroom, and a bathroom. The bathrooms are nice with an easy to get into shower. It was the cheapeast one I found. Pricing depends on what apartment you get. There are lots of activities, exercise classes, and bingo. The food is mediocre. They offer a lot of choices and I usually find something I like, and they have a beautiful dining room with tables with linens and napkins. My mother has been at Rosewood Estates for nearly 5 months now. It offered the type of facility that I needed. There’s a chapel; there are activities where they have outings. They go to Wal-Mart once a week. They take them on visits to the tea room and out to different places for dinners. They have 24-hour staff available if needed. There are at least 2 managers there on site 24 hours, 7 days a week and it’s a very caring facility. They know all of their residents by name and what’s going on with them. My mother is in Rosewood Estates, and our first initial thought was it was great. However, after I signed the paperwork and was locked in to at least three months, I found out several things that the sales rep lied about. She was in a single-room apartment with her bed and living area all in the same area. It's nice, and my husband and I like it. She likes the food and talks about how good it is. She seems to like the common dining room, but sometimes there are issues. She goes to an exercise class every day, plays bingo, and loves the library. There are activities happening most of the day that they can do. Rosewood Estates was good. People seemed busy, active, and doing things. The staff was attentive, involved, and interacting with the residents very well. On-site, it was clean, nice apartment living. Rosewood Estates was really nice. The only thing we did not like was it was in a really busy road. They had nice apartments. Everything about it was really nice. The people seemed really nice, too. It was a little bit more expensive than the others. I really liked the sense of community at Rosewood Estates. I liked all of the activities that were available. I liked the on-site amenities like the exercise room, TV room, activity room, laundry rooms on each floor, and beauty shop. There were just so many things that I can get to without even going outside if the weather is bad. I am moving on at the end of March. Rosewood Estates is very nice. They are all very nice. There were some activities. I have seen the dining area, and the food is very good. It takes adjustment because I'm accustomed to my food, and the way I cook. They were willing to try and work with you and help you. Rosewood Estates is very nice. They do offer a bus ride to a swimming pool, and they have games and activities that go on there all the time. I haven’t run into a situation that they couldn’t answer my question, and they were very informative. We are in the independent living of Rosewood Estate. We chose it because we can afford it. Everything is fine. The rooms and the dining room are nice. There are lots of activities. I love Rosewood. I wish I lived there; if I were retired, that’s where I want to live. They had activities lined up for them like bean bag, baseball, bingo, they walk the halls, exercise classes, chapel, library, and puzzles. It had everything you would want, but she wound up having health issues. Very elaborate dining area. They had these kids from school all dressed up serving everybody; it was just really wonderful. If she didn’t want to dine there, they take their food to her room. There is also like housekeeping, they supply the linens. It was just perfect and the only one in town that was within my mom’s budget. They may take them to the doctor if they need to; take them to the mall and to go shopping. You don’t have to buy groceries unless you want little snacks; they had it all there. My mother passed, so we went ahead and moved her out, and they were very concerned and very sweet people. I would highly recommend it to anybody. We visited Rosewood Estates last June or July 2013. Everybody was very friendly. I think it was a Christian Place the way everybody talked. They had us over several times for meals. I really like that you can actually order from a menu and you can mixed things up if you don’t like something from the initial menu. If we needed more care, we can be transferred to another section. It's peaceful there. You can stay in your room as much as you want to or you can go out and enjoy different games and exercises. If we can ever get in there, I'll enjoy the exercise equipment that they have. They have a good library and you can put puzzles together. We liked the rooms a lot. The room that we were hoping to get has an outside patio that we could put our porch swing on and other outside stuff that we have. In that way we can just sit outside and enjoy the fresh air if we wanted to. Rosewood Estates was great. Everything was good and nice. The people were friendly. They invited me for lunch and the food was good. 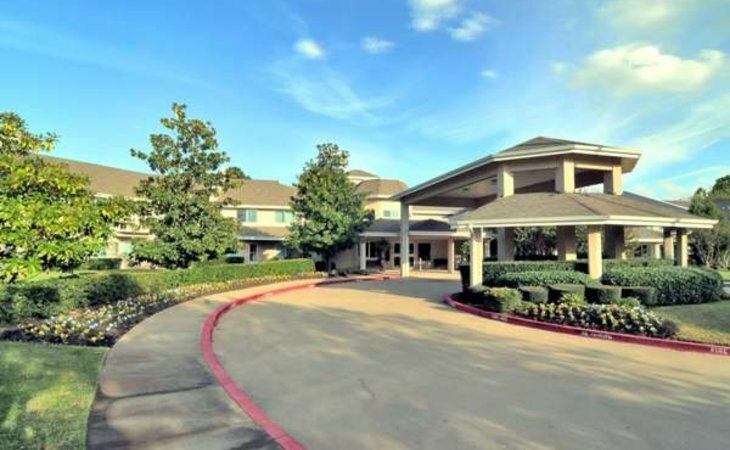 Rosewood Estates is located in Tyler, TX, providing a vibrant backdrop for your new life as a valued member of our caring community. So come to Rosewood Estates for a visit...and stay! What should caregivers and potential residents know about Rosewood Estates?